Holiday homes in converted railway carriages are gaining in popularity again, with more and more lovely conversions becoming available. They attract train lovers of course, particularly when they're located on a working train line or heritage railway, but they make a good choice for anyone looking for somewhere a bit different to stay, something a bit quirky or with a sense of history. Great for a romantic escape too, how about a few nights away staying in a restored Edwardian Pullman train carriage? Here, at Travel-Quest, we're happy to list all types of railway and train related holiday accommodation and our listing pages have one of the most comprehensive lists of these sorts of properties. This article takes a look at one type in particular, the converted train carriage or Camping Coach. The number of converted train carriages available as holiday homes is certainly growing, it's part of the expansion in glamping-type properties now available – but the history of converting rolling stock into self-catering holiday homes actually goes back quite a long way. It was in the 1930s that train companies in the UK started adapting old passenger carriages, no longer suitable for use on the working railway, into holiday accommodation. They were converted to provide basic sleeping and living space on static sites at stations in coastal and rural areas of the country. Local railway staff cared for the camping coaches as part of their duties. 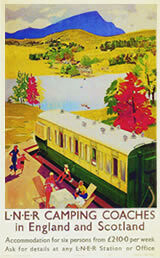 The original Camping Coaches were marketed for inexpensive group and family holidays and holidaymakers were encouraged to travel by train to the stations where they were sited. Guests were also encouraged to make use of the railways to travel around the area during their stay. Camping Coaches gradually gained in popularity until they were withdrawn at the start of WW2; during the war many were used as temporary accommodation for rail workers. Their popularity slowly increased again after they were re-introduced in 1947 and British Railways added a lot more in the early 1950s, but from the 1960s their popularity started to wain and they began to be withdrawn. These days a few of these carriages are still owned, cared for and let out by some of the UK's many heritage railways, but most now are in private hands – often still being rented out as holiday lets. Long gone are the days when renters were told that "drinking water and toilet facilities are available on nearby station premises"; modern conversion are generally self-contained with all necessary amenities; but you'll still find wide variety in the style and standard of railway carriage rentals. Some, particularly those refurbished from original Camping Coaches, are still fairly basic and traditional in style, perhaps re-using original seating, layouts and railway colours. Often the coaches found on heritage railways will fall into this category, but these will still appeal to those with a historical interest and particularly to train and railway enthusiasts, who'll likely be keen to be in the heart of things at the railway, to enjoy passing steam trains and (often) to benefit from free passage on the line during their stay. These days, many of the newer owners are doing far slicker, more contemporary and more individual conversions. There are carriage conversion lounges with cosy sofas and modern wood-burners, thoroughly modern kitchens, and bathrooms with power showers and roll top baths. Conversions with carefully styled retro or vintage looks, or light and airy coordinated colour schemes, or modern designer décor. And conversions with all mod-cons: WiFi, HD TV, music systems, washing machines/driers, jacuzzis/hot tubs, patios, gardens, or use of swimming pool. In some way you might describe these converted carriages as the first Tiny Houses, and some of their attraction is in marveling at how their designers have fitted the facilities of a house into a much smaller space. While most railway carriage holiday rentals are found in-situ on sidings at working train lines or heritage railways, or at disused railway stations, an interesting variation is when a carriage is moved to a new location and used as part of a holiday property. That might mean a veranda down one side to add extra living space; or a shed roof above to add weather protection; or the grouping two or more carriages, with the gaps filled to provide additional living area. There are some nice examples on our listing pages, take a look at Seabank, a beachfront villa in West Sussex, or Southern Bell on Hayling Island – both, in very different styles, created around two restored carriages; they still retain their quirky railway feel, but benefit from lots more group or family space, as well as a seaside location. We've a separate entry for train and railway accommodation across the globe, which includes many of one very special type of rail car conversion, one not found in the UK – the caboose – that iconic little, quintessentially red, carriage found at the back of old North American freight trains. In the days when brakes were still applied manually the caboose was home to the brakeman, flagman and conductor and the distinctive windowed cupola on top was used as a lookout to observe the full length of the train. Across the States, Canada and in Australia you'll now find many of these distinctive rail cars converted to self-catering holiday homes or used as B&B or even hotel rooms. As ever, the conversions vary in quality and style, so you'll need to look carefully at photos and reviews to check them out. Some conversions combine more than one car, others have separate buildings for things like bathrooms or kitchens. The copela, atop the car, allows light to flood in and the area directly below is often used as a main seating or dining area; but we've seen copelas with comfortable seating added so they can still be used as actual lookouts (perhaps for birdwatching or just enjoying the sunset), or used to provide a unique mezzanine-type sleeping area. 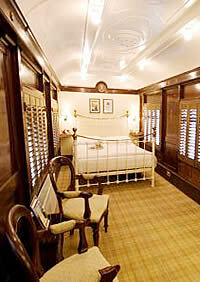 One final variation are railway carriage hotels or guest house/B&B accommodation. There are several nice examples on our listing pages, but our particular favourite is The Old Railway Station at Petworth in West Sussex – this is a whole station complex with bedrooms in luxurious former Edwardian Pullman carriages and reception, lounge and dining areas in the old station buildings. The Old Railway Station has been carefully restored and retains its original character and many original features; it uses classic, elegant décor, reflecting the Edwardian period, but provides all modern needs, including en-suite bathrooms, TVs and WiFi.